Digital I/O Module suits USB-based embedded applications. Housed in 4 x 4 x 1.25 in. steel enclosure, Model USB-DIO24-CTR6 adds portable, industrial strength digital I/O and counter capabilities to any PC or embedded system with USB port. Unit features 24 lines of CMOS/LVTTL high-current digital I/O with 2 fully undedicated 82C54’s, yielding 6 counter/timers and access to input, gate, and output pins. Micro-fit USB header connector is provided in parallel with high retention type B connector and can be used for stacking and embedded OEM applications. 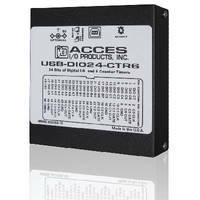 SAN DIEGO, CA — ACCES I/O Products, Inc. reveals its newest USB digital I/O module— Model USB-DIO24-CTR6. This multifunction, high speed USB device is an ideal solution for adding portable, easy-to-install, industrial strength digital I/O and counter capabilities to any PC or embedded system with a USB port. An ideal choice for embedded system and test designers, the USB-DIO24-CTR6 can be used in an assortment of USB-based embedded applications including light, motion, and process controls. The USB-DIO24-CTR6 features 24 lines of CMOS/LVTTL high-current digital I/O with two fully-undedicated 82C54’s, yielding 6 counter/timers and access to the input, gate, and output pins, all packaged in a small, rugged, industrial enclosure. A micro-fit USB header connector is provided in parallel with the high retention type B connector and can be used for stacking and embedded OEM applications. Available accessories include a wide variety of cables and screw terminal boards for quick and easy connectivity. • Compatible with industry standard I/O racks such as Grayhill, Opto 22, Western Reserve Controls, etc. The USB-DIO24-CTR6 is designed to be used in rugged industrial environments but is small enough to fit nicely onto any desk or testing station. The board measures just 3.550 by 3.775 inches and ships inside a steel powder-coated enclosure with an anti-skid bottom. A DIN rail mounting provision is available for installation in industrial environments. What makes the OEM option unique is that its PCB size and predrilled mounting holes match the PC/104 form factor (without the bus connections). This ensures easy installation using standard standoffs inside most embedded enclosures or systems. The USB-DIO24-CTR6 can be integrated into any PC/104-based stack by simply connecting it to a USB port included onboard with embedded CPU form factors. The USB-DIO24-CTR6 utilizes a high-speed custom function driver optimized for a maximum data throughput that is thousands of times faster than the USB human interface device (HID) driver used by many competing products. This approach maximizes the full functionality of the hardware along with capitalizing the advantage of high-speed USB 2.0. The USB-DIO24-CTR6 is supported for use in most operating systems and includes a free Windows and Linux (including Mac OS X) compatible software package. This package contains sample programs and source code in C#, Delphi, and Visual C++ for Windows. Also provided is a graphical setup program in Windows. Linux support includes installation files and samples for programming from user level via an open source kernel driver. Third party support includes a Windows standard DLL interface usable from the most popular application programs, and includes LabVIEW 8.5+ VIs. Embedded OS support includes Windows Xpe, WES7, etc. Readers can view a data sheet and manual for the USB-DIO24-CTR6 by visiting the product webpage at www.accesio.com/USB-DIO24-CTR6.